Remember that the data on your profile must be accurate and truthful, that is, it must contain the correct information, just as it is in the passport of the applicant requesting the visa, regardless of whether it is a minor or not. Once the data has been entered into the profile and associated with a payment receipt, it is not possible to make changes to the profiles. If the data on the profile does not match with your passport information, you will have to make a new payment. Please remember, the MRV fee is non-refundable and non-transferable. You can pay your nonimmigrant visa application fee with cash at Servimás. Before going to a Servimás branch, you must print one applicable U.S. visa application deposit slip per applicant (or per family group). DO NOT print multiple copies of the same deposit slip. You must have a unique deposit slip for each applicant. Take the printed deposit slip with you to the Servimás teller. If you do not have the deposit slip or if you have multiple copies of the same receipt, you will have to return at a later time to pay the fee with the proper documentation. Failure to follow these instructions can lead to delays in your ability to schedule an appointment. Upon receiving of your payment, the Servimás teller will issue you a receipt. Save your receipt. It cannot be replaced if it is lost. You will not be able to schedule an appointment without your receipt number. Select the deposit slip that matches your visa application fee from the list below. This page has more information about the different visa application fees. After you have paid the visa application fee, keep the receipt for your records. It cannot be replaced if it is lost. You will not be able to schedule an appointment without your receipt number. 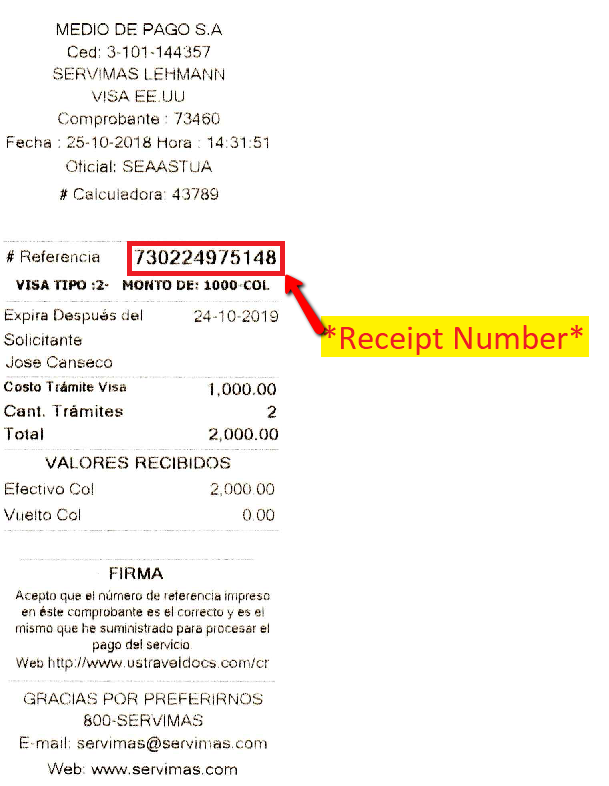 You can schedule your interview the following business day after you have paid the appropriate fee at Servimás branch.The “Reference number” is the one that you will have to input during your scheduling process to complete it. The most convenient payment method for your nonimmigrant visa application (NIV) fee is online with a Debit Card (Checking Card, Banking Card). Credit cards are not accepted and are automatically rejected. If you attempted to use a credit card, you could see a hold (floating or pending) charge on your statement. As we reject credit cards, we do not control when your financial institution releases this hold to you. Contact your financial institution for more information. Once you log into your profile and while on the payment screen, you can select to pay by debit card. When you have completed the payment, you MUST return to the profile and hit 'Continue' to schedule the appointment. Follow all the steps and when you are prompted for payment again, you should select the Debit card payment option, so that your receipt gets linked correctly to the profile. Note: If you experienced an error at the time of payment, do not make a second payment. We do not accept credit cards - make sure you are using a debit card. 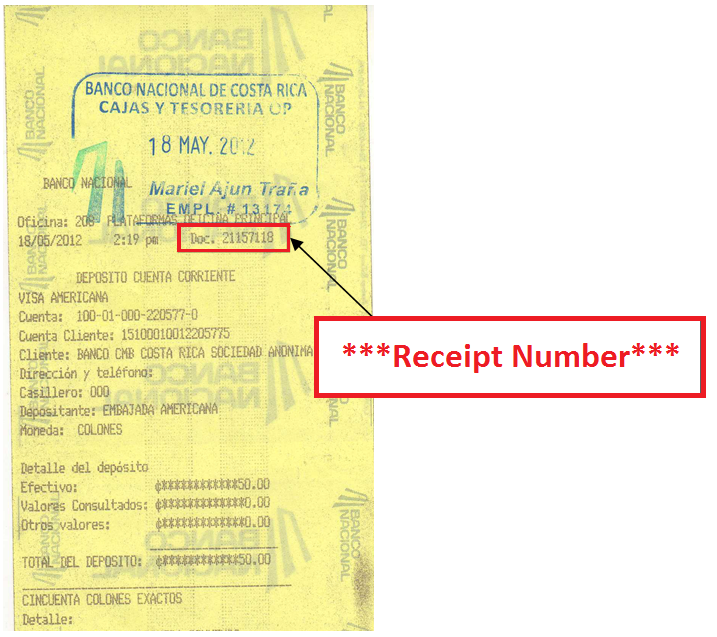 If you are using a debit card, contact us at support-costarica@ustraveldocs.com. You can pay your nonimmigrant visa application fee with cash at Banco Nacional. Before going to a branch, you must print one applicable U.S. visa application deposit slip per applicant. Take the printed deposit slip with you to the bank. If you do not have the deposit slip or if you have multiple copies of the same receipt, you will have to return at a later time to pay the fee with the proper documentation. Failure to follow these instructions can lead to delays in your ability to schedule an appointment. Upon receiving of your payment, the bank will issue you a receipt. Save your receipt. It cannot be replaced if it is lost. You will not be able to schedule an appointment without your receipt number.